We know that no other species has had so great an impact on the planet as us. What we haven't known – until now – is how to quantify that impact. 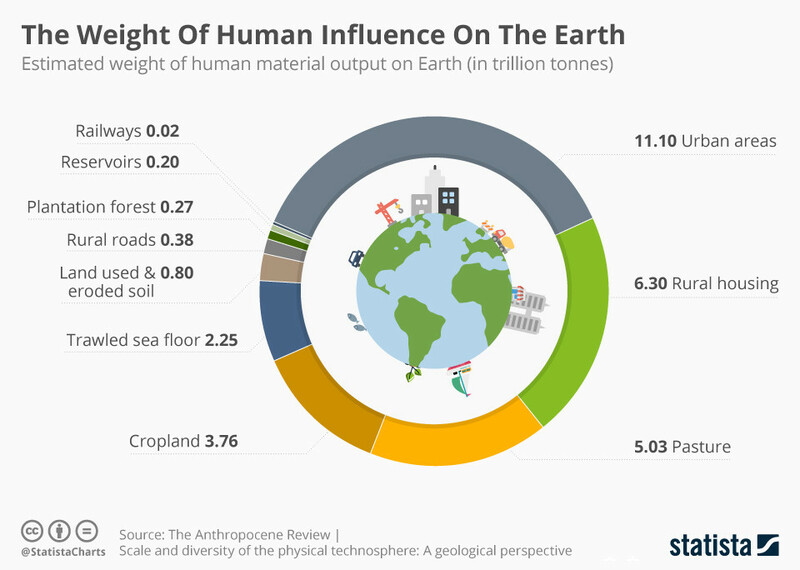 Thanks to the estimates in a new report, however, we can now place the sum total of our material output on Earth at over 30 trillion tonnes. Who came up with the number? The research was published in the Anthropocene Review , a scientific journal that gathers together peer-reviewed articles on the nature of the current geological epoch, one defined by the presence of man. While our biosphere would incorporate the total mass of all living things on Earth, the technosphere includes the summed material output of the human race. It's this that the research aims to calculate. The report breaks down the human effect into different aspects of activity. Here are the top 10 aspects, visualized in the Statista chart above. Urban areas have the greatest impact by far (at 11.1 trillion tonnes) with rural housing coming second, at 6.3 trillion. The authors note that while these numbers are difficult to guarantee with precision, they are of the correct order of magnitude. In the present day, the biomass of the entire human race is approximately equal to 300 million tonnes . This is more than double that of all large terrestrial vertebrates that lived on Earth prior to human civilization, and an entire order of magnitude greater than that of all vertebrates currently living in the wild. At 30.11 trillion tonnes, the size of the technosphere is five orders of magnitude greater than even that. It is the equivalent of every single square metre of Earth’s surface being covered with nearly 50kg of matter. Atmospheric carbon dioxide makes up just a small part of the technosphere, and our production of the harmful gas currently sits at 1 trillion tonnes. Although that only contributes to one-third of the total, it is still enough to balance out 150,000 Egyptian pyramids. It is also enough to fill a layer approximately 1 metre thick across the entire planet – a layer that grows thicker by a millimetre every fortnight. And that's not even counting the quarter of our carbon dioxide emissions that sink into the oceans.